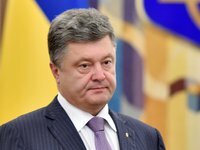 The Ukrainian presidential administration is accrediting the press to cover presidential candidate Petro Poroshenko's attendance of the debate at the Olympiysky Stadium in Kyiv on April 14. According to the statement posted on the presidential administration's website, Poroshenko will arrive at the stadium at 14:00. The admission of accredited journalists will begin at 13:00 by passports and journalist ids. Earlier, the Poroshenko campaign announced the election debate to be held between Poroshenko and Volodymyr Zelensky at the Olympiysky Stadium at 14:00 on Sunday. Meanwhile, Zelensky insists that the debate be held on April 19. Zelensky and Poroshenko will be competing in the runoff presidential election on April 21. Zelensky won 30% of the vote in the first round of the election on March 31, and Poroshenko gained around 16%. Judging by the information presented at a press conference at Interfax-Ukraine on April 11, some 61% of Ukrainians who are planning to cast their ballots will vote for Zelensky, and 24% will choose Poroshenko.